Research published in PLOS ONE finds that 81% of participants in the World Climate Simulation, a role-playing game of the UN climate talks, showed increased motivation to combat climate change, even among Americans who are free market proponents, a belief strongly linked to denial of human-caused climate change in the United States. The researchers also found that the game reaches people outside the traditional climate change ‘choir,’ including free-market proponents and people who knew and cared little about climate change before participating. In fact, these people experienced greater gains in knowledge, urgency, and motivation to act. This finding is particularly exciting given the failure of many prior climate change communication efforts to reach across the political spectrum and to engage people who are not concerned about the issue. The study relied on statistical analysis of surveys that participants completed before and after experiencing World Climate. The World Climate game is “an engaging, social experience grounded in the best available climate science,” comments Rooney-Varga. Participants take on the roles of national delegates to the UN climate change negotiations and are charged with creating a global agreement that successfully mitigates climate change. As in the real negotiations, each delegation offers policies for their greenhouse gas emissions. The developed nations pledge contributions to the Green Climate Fund to help developing nations cut their emissions and adapt to change; the developing nations specify how much they need to do so. Their decisions are then entered into the climate policy computer model, C-ROADS, which has been used to support the real negotiations, giving participants immediate feedback on the expected climate impacts of their decisions. First round results usually fall short, showing everyone the likely harm to their prosperity, health and welfare. 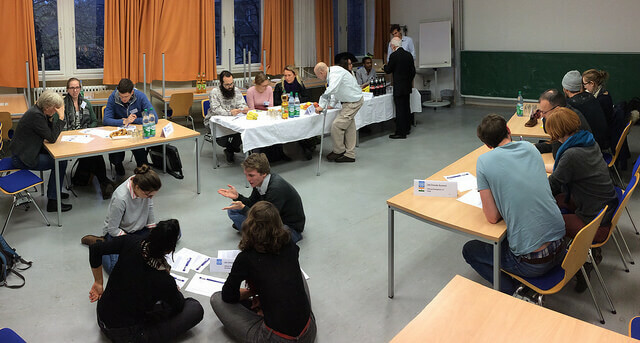 Participants then negotiate again, using C-ROADS to explore the consequences of more ambitious emission cuts. World Climate is designed for ease of use. As of July 2018, more than 43,000 people in 78 countries around the world have participated in it. The simulation has been reviewed by independent educators and scientists, found to support national science education standards in the US, and designated as an official resource for schools in France, Germany, and South Korea.